Prendergast's The Shore, painted around 1913-1915, with its broken colour closely relates to the neo-Impressionist works of Paul Signac of Saint-Tropez and Marseilles and Henri-Edmond Cross's landscapes of the Cote d'Azur that were done in 1906-1907. Prendergast arrived in Paris at the end of May 1907 too late to see either the exhibition of Signac's works at the Galerie Bernheim-Jeune in January-February or Cross's exhibition at the same gallery in April-May. He also missed the display of their works at the twenty-third exhibition of the Independents, but he was probably familiar with the Cross exhibition catalogue with a preface by Maurice Denis, as well as the fully-illustrated Signac catalogue with a preface by Paul Adam. "I am so chocked full of the exhibitions here, " Prendergast wrote before leaving Paris in autumn of 1907, "I don't know what influence it will have after I am once more home." Matisse's Luxe, calme et volupté painted in 1904-1905 while he was a companion of both Signac and Cross, shares the design and spirit, although in its riotous display of colour not the subdued tonality of Prendergast's The Shore. Each French painter, in turn, as well as Prendergast, was influenced by the elegiac compositions of Puvis de Chavannes. But the sense of festive pageantry found in the clothed figures parading across the foreground of The Shore and the subtle tones of Prendergast's watercolour suggest another source. The artist was greatly impressed by the paintings of Carpaccio which he saw in Venice during his 1898-1899 visit to Europe. 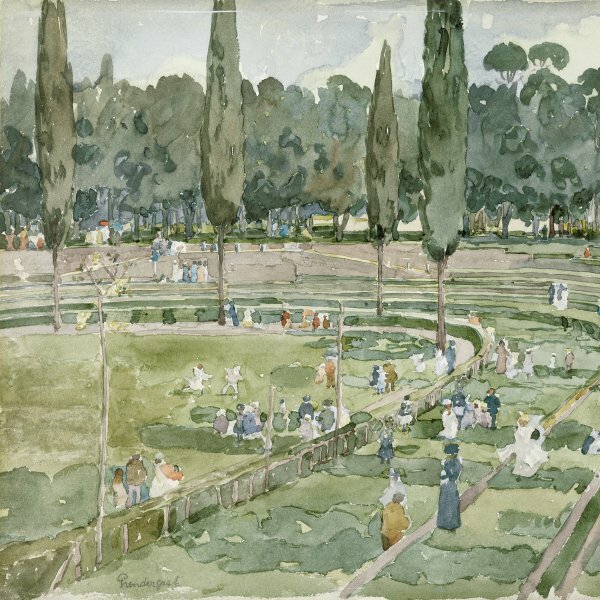 Carpaccio's warm muted tones are captured perfectly in Prendergast's watercolour, while the distinctly vertical tree with its sparse foliage on the right of The Shore is a virtual quote from a Carpaccio canvas. During the period that Prendergast painted The Shore, the artist was experimenting with broken colour, using mosaic-like blocks of pigment, and depicting subjects that were often Oriental. Prendergast had even, as Walter Pach related, obtained "a supply of the little cubes of stone or glass [and] tried some mosaics of his own". 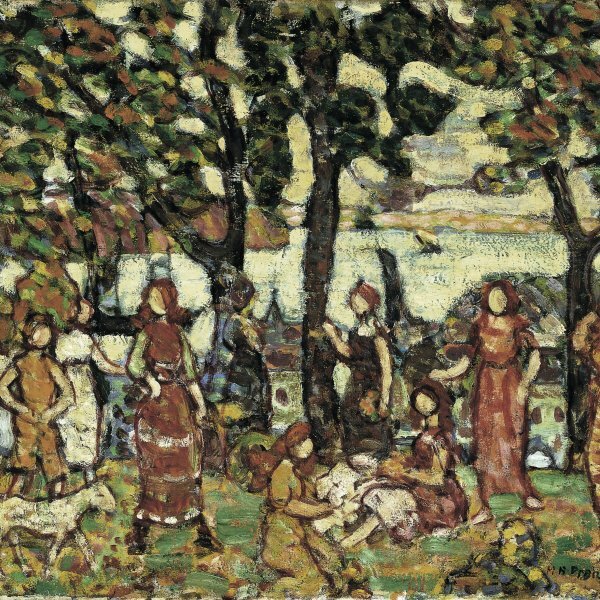 But The Shore is more linear in quality than Prendergast's mosaic-like paintings and more monochromatic in colour. 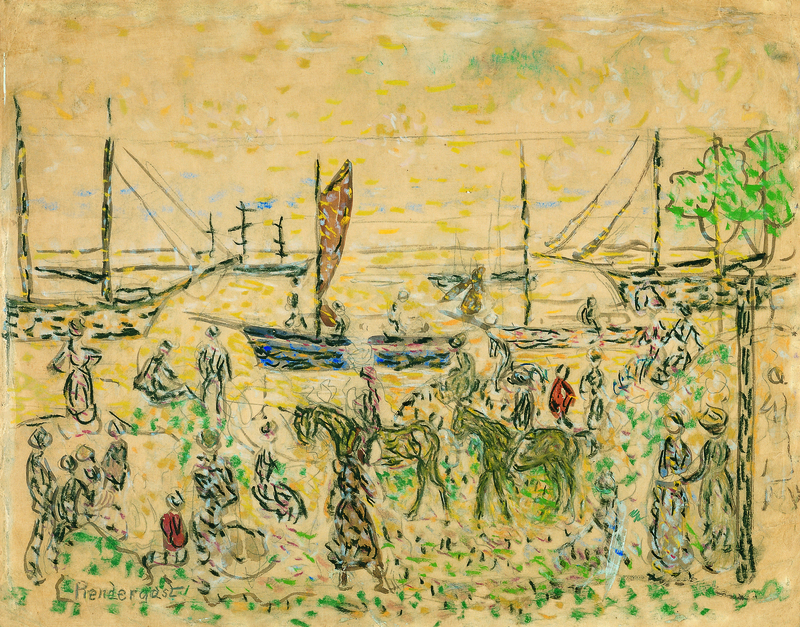 While it relates slightly to Sailboats with Figures in Foreground, c. 1912-1915, Alabama, Montgomery Museum of Fine Arts, the watercolour is unique in Prendergast's oeuvre. 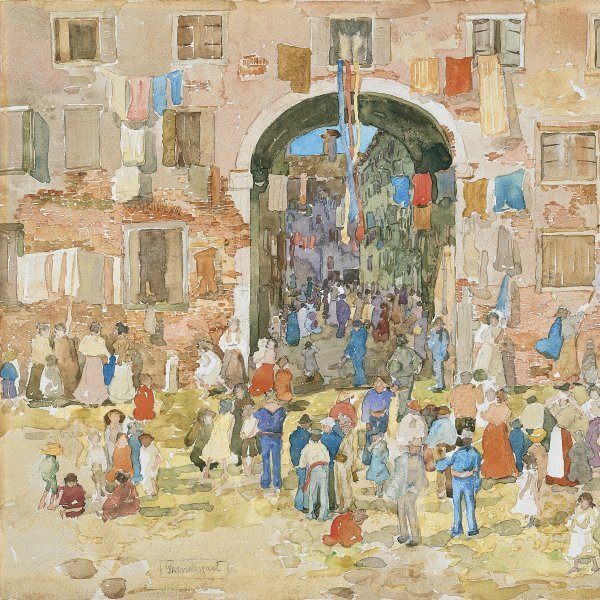 In his late watercolours Prendergast would work first in watercolour and then enhance his work with pastel which allowed him to make colour changes unattainable in watercolour. But in The Shore, the darker tones of watercolour and lighter tones of pastels are juxtaposed across the surface of the neutral ground of the composition. Ira Glackens, son of William Glackens who was a member of The Eight, recorded the value that Prendergast attributed to the pigments used in his watercolour and pastels which the artist had brought back from Europe. His workbench, Ira wrote, "was covered with sticks of pastel and little glass jars of water colours. These colours were very precious and came, I believe, from Germany. In particular there was a jar of red-a beautiful dry vermilion that no other brand of water colours could equal. The pastels were mainly French and also prized, being far superior to domestic ones, [...] There were blues and purples no longer obtainable. These paints and pastels were the Prendergasts' most prized possessions."